We also carry many discontinued items. Call to check on selections. We accept Visa, Mastercard and Discover. Order by phone, fax or email. "Lacking knowledge regarding dolls and collectible dolls, I had no idea what to get a young relative for her birthday. I happened to see this store that day and found the items very fitting as a birthday present. The owner (I presume) was quite knowledgeable about the items he was selling and seemed to have extensive experience. Prices were fairly reasonable, and the environment was very, very friendly." 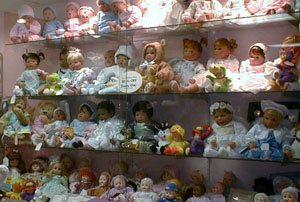 -Andrew L.
"A great source for doll collectors who want unique and beautiful dolls. I collect Madame Alexander and was quiet pleased with their selection. I have bought from them a couple of times, the best time is during Christmas or right after, which is when they have sales. The store is quiet charming, as is the owner who is very knowledgeable and always willing to help when possible." -Michelle R.
* Quotes taken from Judy's Book. Copyright ©1988-2010 The Littlest Princess Doll Shoppe. All Rights Reserved.